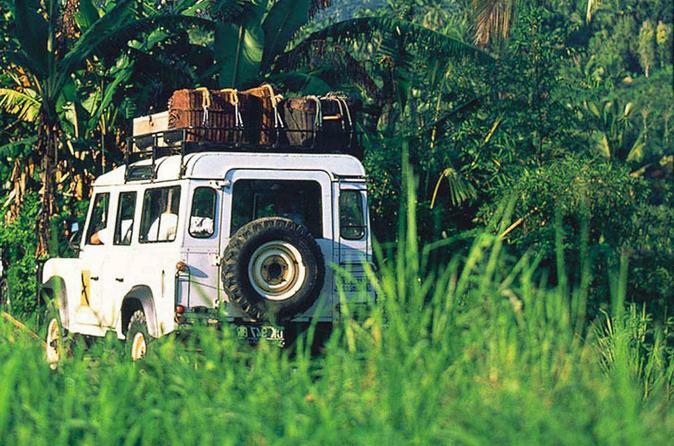 Experience the beauty of Bali in this full day small group four wheel drive guided experience. Explore hidden country trails, stunningly beautiful and rural landscapes and friendly locals. Discover ancient temples, hidden hot springs and experience traditional Balinese dishes at lunch, from the top of breathtaking Batukaru Mountain, with its panoramic views across the valley. Leave the beaches and markets behind as we take you outside of the places tourists usually tread, on this full day 4WD small group experience. Explore hidden country trails, stunningly beautiful and rural landscapes and friendly locals. Discover ancient temples, hidden hot springs and experience traditional Balinese dishes at lunch, from the top of breathtaking Batukaru Mountain, with its panoramic views across the valley. As you drive out of the city with your local guide, explaining in more detail Balinese lifestyles, traditions and the areas covered on this experience. From sweeping lush green rice paddies, to gentle fun happy go lucky locals in local villages, this experience gives you the chance to see the real Bali, beyond the tourist sites. Stopping along the way we visit centuries old stone mason work shops and quarries, where many of the hand carved stone deities can be seen in Bali, beautiful lush farm plantations with their colorful fields of Coca and Vanilla plants, stopping for tea and coffee at one of the local farms, where you will learn more about farming expensive crops like vanilla, coca and coffee crops. Driving up into the bamboo mountains, we arrive at the sacred Batukaru Mountain, stopping for lunch (please advise in advance if you are vegan / vegetarian or have any specific dietary needs). In the afternoon after a sumptuous local lunch, we travel to the hot mineral springs. Nestled between lush green terraced rice fields, you will learn how the ancient springs were used and are still used today, before we head back down the mountains to your hotel, where our journey ends.